The AN-FM-64000-GETH-SNMP is optical transmission equipment based on Application Specific Integrated Circuit (ASIC). It integrates the traditional PDH multiplexer and 1000Mbps Ethernet optical transceiver, and can realize the 64 E1s and four 1000Mbps Ethernet data channel transmission over optical line of 1.25Gb/s, the four 1000Mbps Ethernet data channel share 1000M bandwidth. Implements the device alarm and status monitor, port loop configuration, etc. The color of the chassis is gray in default, it can be customized. Note 1: Items with * symbol means optional. Note2: All the above SFP optical modules support DDM function, if the users use other SFP modules, it is suggested to use the SFP module with DDM function, otherwise, some information may not be uploaded and shown correctly. E1 card slot, this slot can be free, if there is only one E1 card, the E1 card must be inserted in this slot, not Connector_2. Note1: For the service card, Hot plug is not supported! 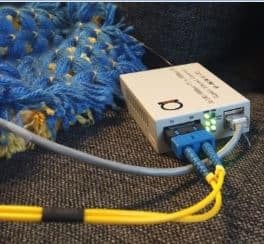 Note2: Before hot plugging the SFP optical module, both the operator and the device must be connected to the same earth in a reliable way! Otherwise, the device may be damaged! Fiber Multiplexer, 64 E1s and four 1000Mbps Ethernet data channel transmission over optical line of 1.25Gb/s, the four 1000Mbps Ethernet data channel share 1000M bandwidth, supports SNMP. In point-to-point mode, the Ethernet transmission bandwidth can be doubled to 2.5G by setting the port-trunking function. 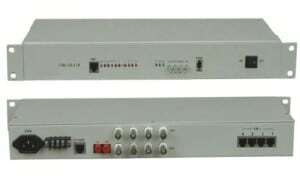 The AN-FM-64000-GETH-SNMP is designed as a modular system with several optional E1 cards and power cards to meet the various application requirements. It provides one optical Gigabit Ethernet interface (SFP optical module) and three electrical Gigabit Ethernet interfaces (RJ45 connector) compliant with IEEE802.3 serial standard. It provides dual hot-pluggable optical interfaces to realize 1+1 optical protection, furthermore, it owns many humanize functions, such as Automatic Laser Shutdown (ALS), Remote Power down Detect (RPD), prevent Ethernet frames from looping back in case of unexpected optical loopback and so on. It supports the management based on Command Line Interface (CLI). With the super terminal integrated by PC, user can realize the monitor and configuration of the device. It also supports Simple Network Management Protocol (SNMP). With low power consumption, high integration and well stability, it is a cost-competitive solution for the application where gigabit Ethernet and E1 are required simultaneously, such as the telecommunication, the electric power and the finance fields.